If you wish to send me the image by email I can work with you on a size and a price. Before taking your photos please go to my "Taking a photo of our pet page". These prices are for a very detailed painting. Other options are available if you wish I can work with you on that as well. Sizes larger than 18 x 24 please send me and email at kym@livingoilpaintings.com or go to my CONTACT page and I will work with you on a price and size. Rest assured that you will get my personal attention. Multiple Pets If you are considering more than one pet in one portrait, I can advice you as to the size that may work best once I see your photos. It is difficult to paint more than one pet in the smaller sizes. For any portrait under $1000.00 I ask for 50% deposit on your portrait. For anything more than $1000.00 I ask for $500.00 deposit. As soon as I get your deposit I will put you on my schedule. I have a secure web site shopping cart in order to process your payment and can set a purchase option just for you. Or you may call me with you credit card information 213-444-9558. 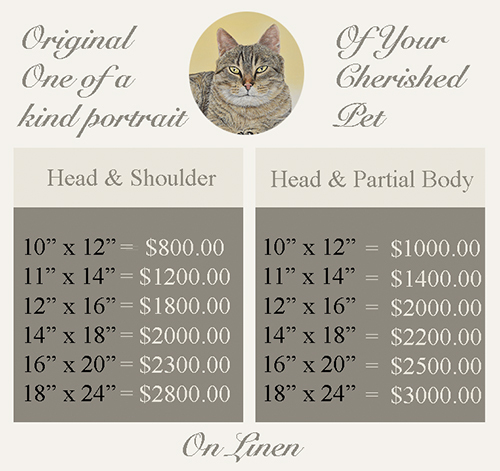 I look forward to working with you on your "forever" portrait of your beloved pet.